Very Good. 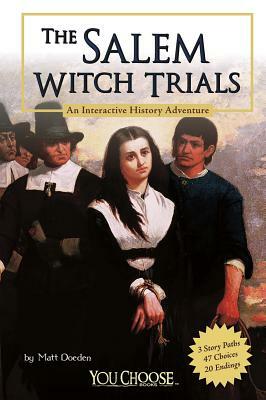 The Salem Witch Trials: An Interactive History Adventure (You Choose Books (Paperback)) by Doeden, Matt. Trade paperback (US). Glued binding. 112 p. Contains: Illustrations, color. You Choose Books (Paperback). Intended for a juvenile audience. Good. The Salem Witch Trials: An Interactive History Adventure (You Choose Books (Paperback)) by Doeden, Matt. Trade paperback (US). Glued binding. 112 p. Contains: Illustrations, color. You Choose Books (Paperback). Intended for a juvenile audience. New. Library binding. Paper over boards. 112 p. Contains: Illustrations, black & white, Illustrations, color. You Choose Books (Hardcover). Intended for a juvenile audience.